Let's address something every musician deals with at some point: GAS. No, I'm not talking about the kind on Family Guy that makes us laugh. I'm referring to Gear Acquisition Syndrome. Seemingly every guitarist, bassist, and drummer I've met in my 10+ years of recording music has established a relationship with me based on our common knowledge and differences of opinion on music gear. Don't get me wrong, there's nothing wrong with making friends by nerding out on gear. But, when we apply this notion to our music rather than the people playing it, we run into problems. In all my years of recording music and serving in church bands, GAS has been a thing I've witnessed firsthand and tried to avoid like the plague. Great sounding gear is important in both creative and technical aspects, but I personally know some truly excellent musicians who spend more time crafting and tweaking their tone than actually playing music. I find this particularly prevalent among worship band musicians, but it's rampant in every genre. Don't get me wrong, I'm not advocating the use of $20 DI amplifiers and $50 yard sale drums that sound like wet cardboard. This is my case: spend as much time learning and perfecting your music as you do working on your tones. Good tone with great playing trumps great tone with mediocre playing 100% of the time. For example, let's take a look at Eric Clapton. His guitar tone never sounded exactly the same across his many records. His musical style is what makes him unmistakable as an artist; his tone always fits the context. His musical fingerprint lies in his playing, not his sound. 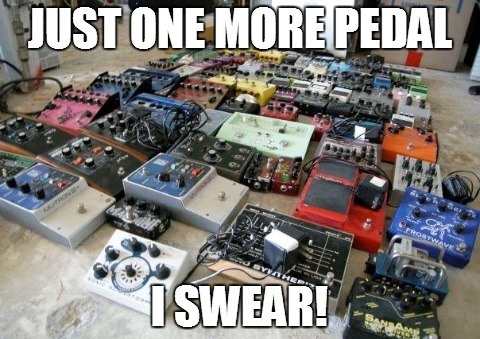 Unless you're Adam Jones from Tool, you don't need this many pedals. Avoid GAS and be intentional with your purchases. Music gear loses value like a used car; the moment you take it out of the store as new it loses at least 40% of its value. When you make a purchase, make it count. When you hit the stage or the studio: know your sound, but know your music better.